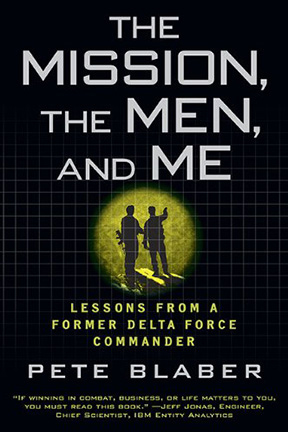 Pete Blaber’s book “The Mission, the Men, and Me: Lessons from a Former Delta Force Commander” gets a lot of rave reviews about business practices and management tips. It’s hard not to agree with some of his principles, such as “Don’t Get Treed by a Chihuahua”. This phrase is a cute way of saying know your adversary before taking extreme self-limiting action. Who would disagree with that? But I’m getting ahead of myself. The book begins with a story of childhood, where Pete reflects on how he topographically mastered his neighborhood and could escape authorities. That gives way to a story of his trials and tribulations in the Army, where during training he was tested by unfamiliar topography and uncertain threats. It is from this training scenario that Pete formulates his principle to not jump off a cliff when a pig grunted at him (sorry, spoiler alert). How should someone identify whether they are facing a Chihuahua, given their other option is to blindly climb a tree? Pete leaves this quandary up to the reader, making it less than ideal advice. I mean if in an attempt to identify whether you are facing a Chihuahua, wild pig or a bear you get mauled to death, could you sue Pete for bad advice? No, because it was a bear and instead of being up a tree you are dead. Given the lessons learned in joining the Army, Pete transitions to even more topographical study. He masters mountain climbing with a team in harsh weather. It’s a very enjoyable read. I especially like the part where money is no object and the absolute best climbing technology is available. There’s no escaping the fact that the military pushes boundaries in gear research and keeps an open mind/wallet to technology innovations. From there I can easily make the connection to the climax of the book, where he leads a team on a topographically challenging mission and minimizes their risk of detection. It really comes full circle to his childhood stories. However, there are a few parts of the book that I found strangely inconsistent, which marred an otherwise quick and interesting read. I’m not claiming to be an expert in celebrity status or Islam, just saying it should be kind of obvious to everyone in the world that Muhammad Ali (nee Cassius Clay) is far more renowned as a celebrity convert to Islam. I don’t think Cat Stevens even breaks into top ten territory. …famed Olympian, professional boxer and noted public figure. This release consists of materials from FBI files that show Ali’s relationship with the Nation of Islam in 1966. Pete was wandering on that flat line at the bottom while giant mountains of culture stood right above him, unexplored, despite his access to the best tools. There are at least two more examples of this class of error in the book. I may update the post with them as I have time. Very interesting review and I was lucky enough to get it as an audio book for free from Amazon. I will definitely comment here once I finish it. Do you have other book suggestions?